A historic center of learning, scholarship and artistic achievement in Paris, The Latin Quarter's mystique is well-merited. Unfortunately, the area is also a bit of a victim of its own popularity: It can be hard to see through some of the tourist-trap artifices to get at the fascinating heart of this beloved neighborhood. While you won't regret sacrificing a bit of time away from the more tourist-heavy areas of the City of Lights, obviously on a first trip to the capital you'll want to see the big-ticket attractions too. Check out the variety of great activities for prioritizing what to see on your visit to the Quartier Latin, and engage more deeply with its rich, incomparable history. The area around Metro St. Michel is the easiest gateway to the Latin Quarter. To begin exploring in the vicinity, take a stroll along the Quai St Michel which runs alongside the left bank of the Seine River; admire the Square St Michel (with its iconic fountain-statue of the archangel Michael smiting Satan,) and continue walking along the river on the Quai Montebello, continuing eastward from the square. It's typically best to avoid spending too much time in tourist-trap areas such as Rue de la Harpe, full of overpriced and mediocre restaurants. If a restaurant promises "authentic French cuisine" with the aid of a cardboard cutout of a pig donning a chef's hat, or if there are people outside the restaurant trying to lure you in with waves and pushy words, it's very likely not worth your time or Euros. Places around St Michel worth exploring: Rue St-Andre-des-Arts, with its antiquarian dealers, rare booksellers, and cute cafes; Rue Hautefeuille, with its Mk2 Hautefeuille arthouse cinema, and the Gibert Jeune and Gibert Joseph bookshops on and around Place St-Michel, with their bright yellow-orange signs. You may have noticed that this entire district is something of a book lover's dream: From the open-air booksellers with their famed green metal stalls on the Seine to the aforementioned French mega-bookstores on Place St-Michel, you'll easily find a worthwhile tome. There are few places more iconic in the Latin Quarter than this beloved bookshop situated across the Seine and facing Notre-Dame Cathedral. Opened in 1951 by consummate Parisian beatnik George Whitman—who passed away in 2011—it's now owned by his business-savvy daughter, Sylvia. Originally opened as "Le Mistral," this is not the original S&Co shop in Paris: George Whitman renamed it in 1964, in honor of the legendary bookshop opened by Sylvia Beach in 1919 just down the street. Under Beach's helm, the first shop was famous for hosting and publishing literary greats such as James Joyce. The more recent location is still a literary epicenter and a comforting refuge for English-speakers and readers. Make sure to duck inside—early in the morning is best to avoid the crowds—and browse both new and classic titles gracing the shop's narrow, uneven shelves and carefully curated tables. For those visiting Paris for a longer spell, the shop also regularly hosts workshops and talks with great writers; it also hosts aspiring writers and poets, charmingly referred to as "tumbleweeds," by exchanging lodging upstairs for work in the shop. This place is simply timeless and essential. The Sorbonne is a Parisian badge of pride as one of Europe's oldest colleges— it opened in 1257 as part of the medieval Université de Paris. The institution that gave the Latin Quarter its name (after the theology students, mostly monks and other religious figures, who occupied the then-Christian institution and worked exclusively in Latin,) it retains a genuine air of prestige. Unfortunately, it's not very easy to gain admission inside the hallowed walls of the old college to take a peek, but a visit to the pretty traditional square, lined with cafes and trees, is still worth a bit of time out of your day. This humble, little-appreciated museum and former medieval residence is devoted to art, culture and daily life from the Middle Ages. The star attraction here is no doubt "La Dame a la Licorne" (The Lady and the Unicorn), a 15th-century series of enigmatic, luminous Bayeux tapestries that mesmerizes all who come to behold them. There are also interesting objects from medieval daily life, an aromatic garden modeled after those from the Middle Ages, and a basement level that reveals the building's Gallo-Roman foundations displaying that there once were thermal baths on the site. It's an especially cozy and inspiring thing to do in the winter when the chilly temperatures make an indoors activity appealing. The Quartier Latin is, hands-down, one of the areas most blessed with excellent arthouse cinemas. Particularly on a rainy day in Paris, steal away to see an old (or new) movie at The Champo or the Reflet Medicis (both on Rue des Ecoles,) or the Mk2 Hautefeuille on Rue de Hautefeuille near St-Michel. Erected between 1758 and 1790, this neoclassical building with its distinctive off-white dome may not be as famous or popular with tourists as Montmartre's Sacre Coeur—but it's arguably more important from a historical standpoint. This mausoleum pays tribute to the remains of great French minds, from Victor Hugo to Rousseau, Voltaire, Marie Curie and, since 2002, Alexandre Dumas. Perched atop the knoll known as the Montagne St-Genevieve, on a clear day the sweeping views from outside make for a spectacular photo opportunity. 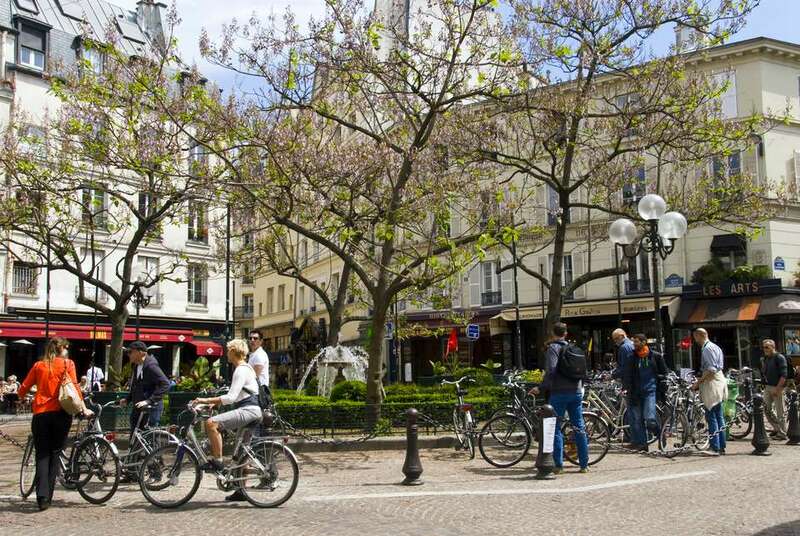 This neighborhood offers everything from vibrant market streets like Rue Mouffetard to classic old squares and pretty streets like Place de la Contrescarpe and Rue Monge. The quiet, charmingly cobbled residential streets are lined with trees and roaming with cats that lead to the magnificent botanic garden of Jardin des Plantes and an epic Natural History Museum. Under the Roman Empire, Paris, then referred to as "Lutetia," was a part of French Gaul. The ruins of a 1st-century AD Roman arena, restored in most places, is relatively little-known among tourists. But it makes for an interesting stop after a whirl around the Rue Mouffetard area, especially for those with interests in history or archeology. Along with the thermal bath structures at Cluny, this is the French capital's most important intact Gallo-Roman site. Connecting the Latin Quarter with the formerly arty St-Germain-des-Prés neighborhood, this breathtaking formal park and garden has it all: Sublime statuary and fountains; alleyways lined with deciduous trees that turn muted shades of red and orange in the fall, and lawns for indulgent summer picnics. The entire area is also replete with literary and artistic history. Avant-garde writer and patron Gertrude Stein and her partner Alice B. Toklas lived behind the park on Rue de Fleurus, and luminaries such as Alexandre Dumas and Richard Wright also frequented the area. Countless famous writers once haunted the tables at this legendary cafe/restaurant. Now a pretty posh affair compared to its bohemian heyday during the 1920s and 1930s, which saw patrons like Ernest Hemingway and F. Scott Fitzgerald engage in liquor-laced arguments and debates about their craft, the "Closerie" is still worth a stop. Especially if you enjoy attempting to travel back in time to the long-lost Paris of books such as Hemingway's "A Moveable Feast."